CivilizationCraft is a game that allows you to create your own Civilizations in Minecraft! Just like in Civilization, you have to research and build up your Civ. However, the game is played from a first-person perspective, you can make your own items, and you can work together with a team of other players! Your main goal in CivCraft is to build your way from a small camp to a conquering empire and claim victory! 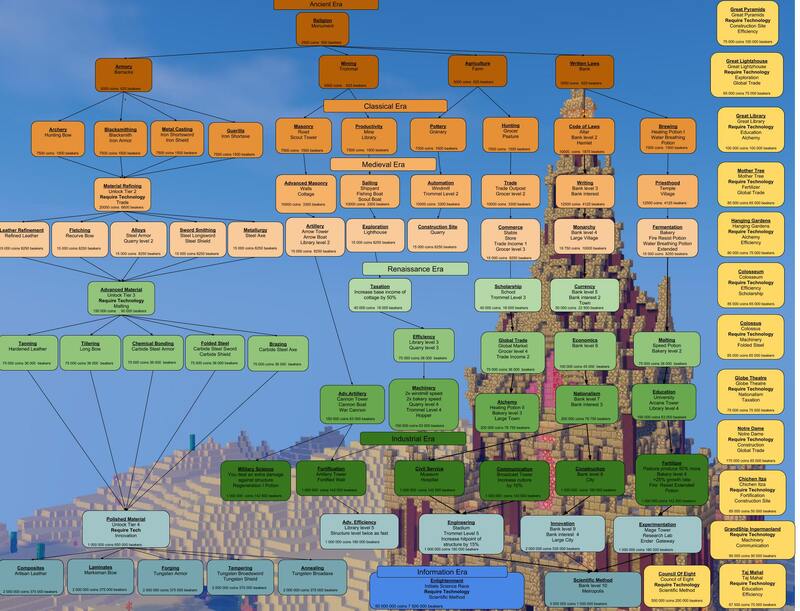 Just like the Sid Meier's Civilization games, you have to research your way through the technology tree to move through the different technological eras and gain access to better buildings. All the buildings are built for you and provide your Civ with the different resources and bonuses you need throughout the game. Expand your claim on the map by training settlers to build more towns. Take advantage of nearby trade and strategic goodies to give your Civ perks. Become a trade town and setup a market, grocery and bank for other players to use. Build and train your units in preparation for the weekly war so you can conquer smaller Civs or delay larger Civs from reaching victory. Plan your town layout for the high efficiency, the best defence, or just to look the best! So whether you join the server with a group of friends to be the next great victors, join an existing Civ to learn from the veterans, or attack the learning curve and branch out on your own, now is the time to get hooked on CivilizationCraft! This page was last edited on 17 October 2018, at 14:19.